I know what's you're thinking. 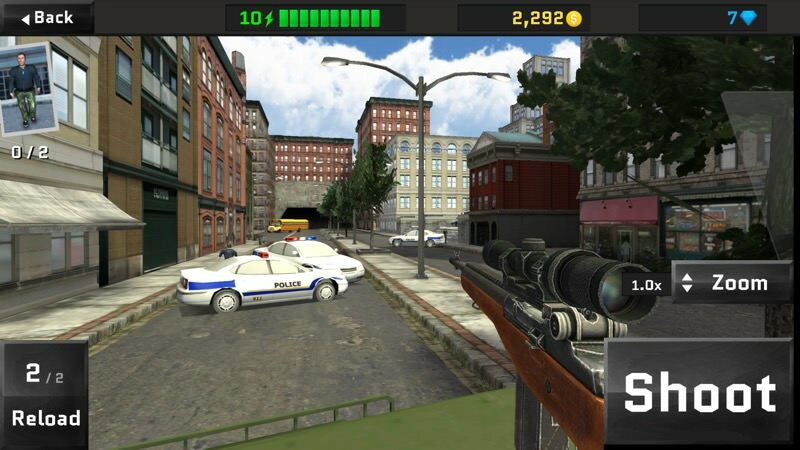 a) There's never a good time to review a sniper game, since there's always some nutter in the news, plus b) this is freemium-fantastic, so surely Steve is going to hate it. However... this is really, really well done. OK, so the lowest freemium IAP is probably the 'real' price of the game, but Sniper Ops 3D is slick, fast and fun. 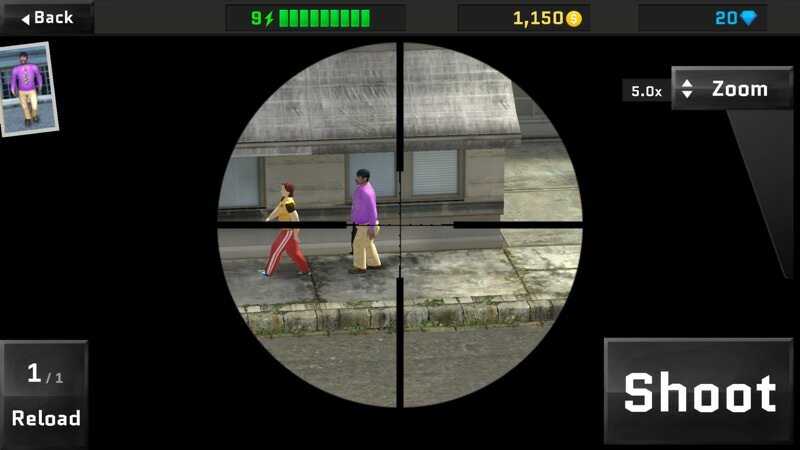 The problem with most sniper games is that you're just tracking a 'scope around a landscape, taking pot shots at targets - and aside from a few scene changes, nothing really varies, so you get bored quickly. 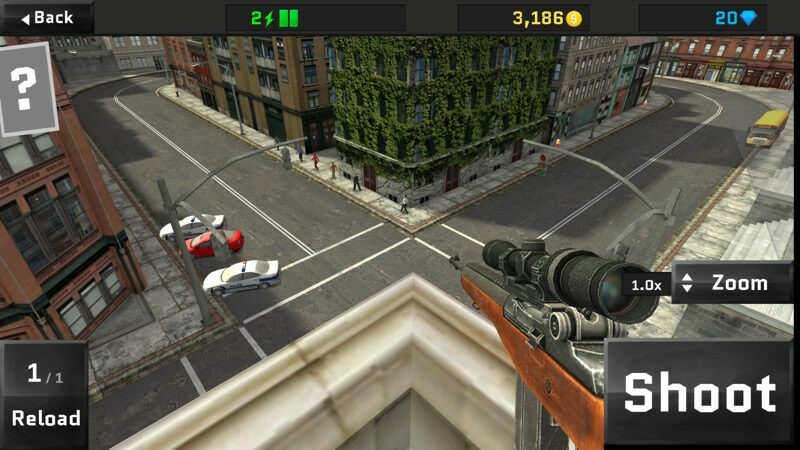 Sniper Ops 3D racks everything up a level by giving you a range of vantage points, several of them mobile, for example, riding on an armoured truck or in a helicopter, with everything rendered in real time rather beautifully. The freemium basics of multiple currencies are here, though the amounts kind of take care of themselves, in that you earn coins and diamonds for a) waiting and coming back later, b) successful missions, and c) watching advert videos (30 seconds and can't be skipped, though any interstitial video ads can be skipped). In practice, after about an hour of missions, assuming you're any good, you're running low and the first IAP will become a good idea. But then that's fair enough, the developers need to eat, etc. 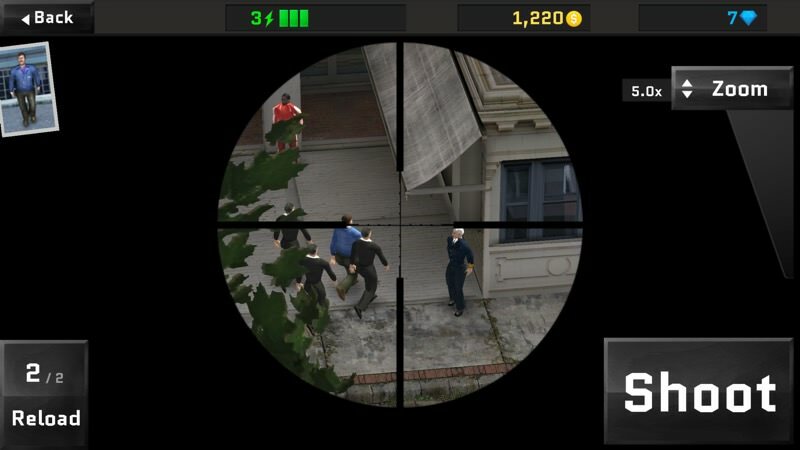 Each mission is introduced with a visual of the target - and, unlike other sniper games, these can be hard to shoot because they're always moving. Rendered in real time, the terrorists move, walking and running - add in wind/hand shake and it's not trivial to complete each mission. After one or two shots (depending on the current weapon that you have afforded) you'll need to reload, just as in real life, so there's then a five second delay before you can fire again, meaning that every shot has to count. 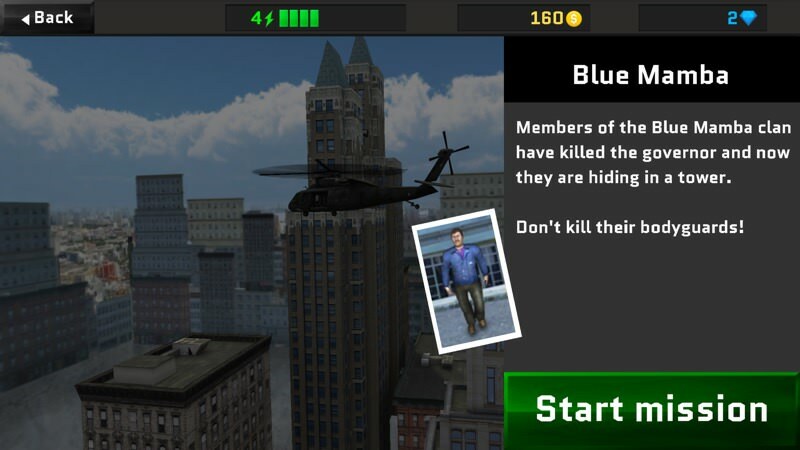 In addition to moving targets, there are plenty of civilians and bodyguards around and these should be avoided - when they're walking in a bunch, taking the shot at the main terrorist isn't easy at all. Thankfully, you only have to hit the target, i.e. you don't have to land a shot in a particular body part. Which helps make progress. The speed at which scenes come up and the fluidity with which you can pan around (swipe anywhere on screen) and zoom in with your telescopic sight (swipe up on the right) are all impressive. I've (obviously) never been a real sniper, but the game feels just 'right'. 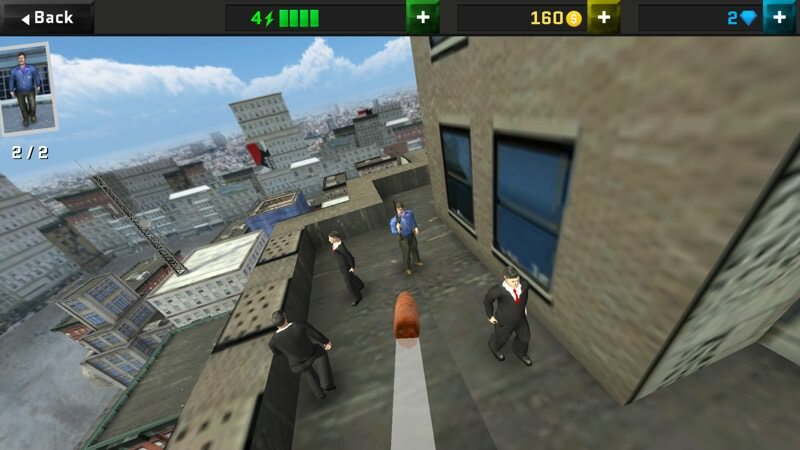 In between each mission there's a chance at a coin-winning mini-game, where you're surprised by a pair of fast-running bank robbers from one corner of the same scene and have to track and shoot them at a distance. It's not easy, but it is possible, and this gives another way to earn in-game currency. 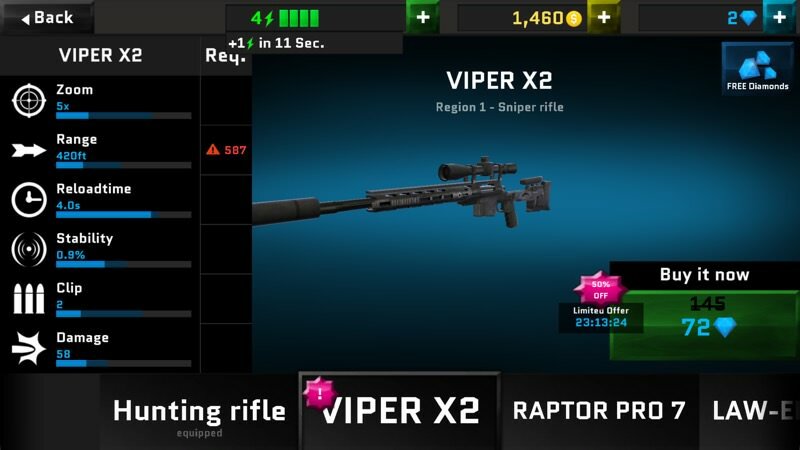 Bit by bit, as the missions ramp up, you need more powerful guns with upgraded capabilities, and this is where the in-app-purchases (IAP) come in. 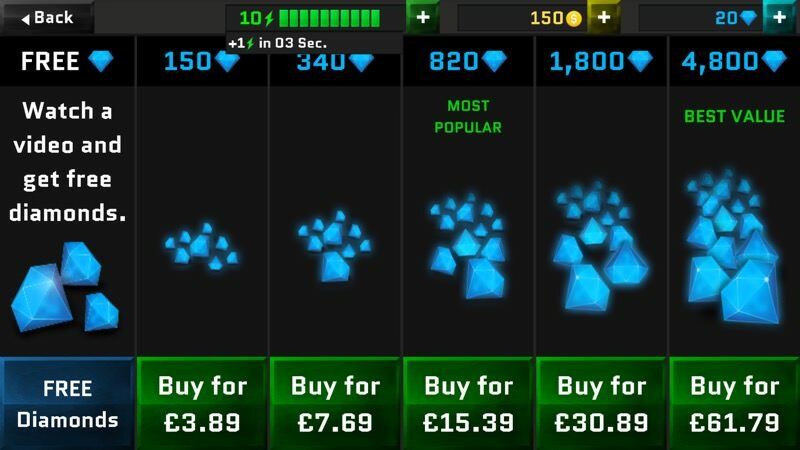 As a guide, 150 diamonds is enough for quite a few hours play, so consider £3.89 the real price of the game - it's certainly not outrageous considering the fun you're presumably having with the title. As usual, I have to dock the developers some points for a 'far too greedy' set of high value IAPs - look, if someone runs out of currency then they can just use the cheaper and smaller IAPs again - the value per 'diamond' isn't that much different. Sigh. These freemium buying mechanics are finely pitched and probably err on the side of being onerous, but I'm giving Sniper Ops 3D a pass here because the game itself is so smooth and imaginative, updated regularly through 2016, so this isn't a publish-and-forget game. 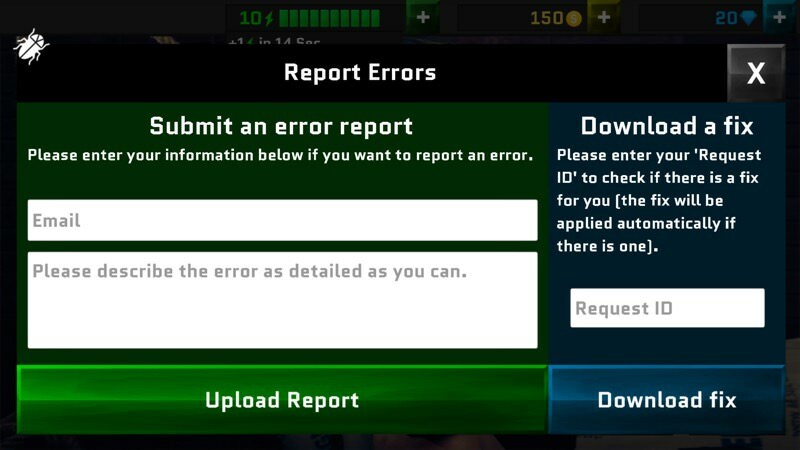 Impressive is that there's an error-reporting dialog available from the opening screen, with the developers opening up a dialog with the user to let them know when a fix for a particular issue is available - I don't think I've ever seen all this in a game before. But back to the game - as you shoot, if your shot is on target, you're treated with a typical 'bullet view' swoop through the air, ending with some token blood on the target and them falling to the ground. All rendered in real time very impressively. But it's the creativity behind the missions and graphics that spurred me to write this up as a full review. For example, in the mission below, the truck you're travelling on bumps its way up the blocked street, bouncing over the kerbs in realistic fashion. This is almost console quality FPS action at times, all with the sniper feel. Amazingly, Sniper Ops 3D is less than 50MB to download too (though there are assets which get grabbed as you along, up to another 50MB), so it's not a game that takes over your storage and which you're itching to uninstall. 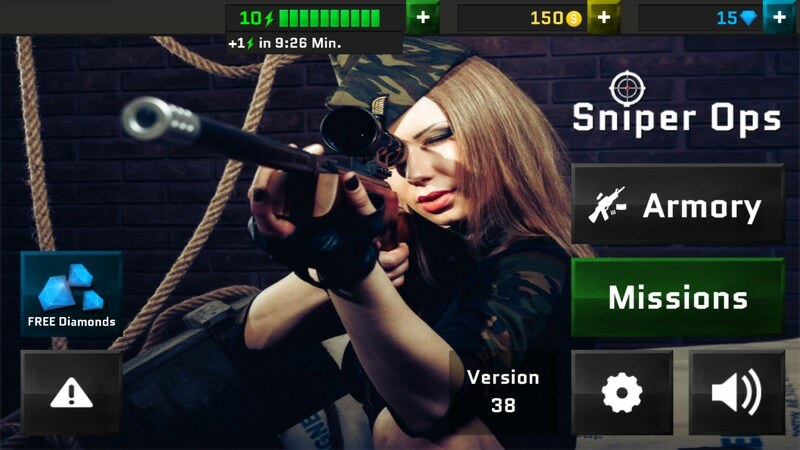 In short, freemium or not, Sniper Ops 3D: Kill Terror Shooter had me hooked. And that can't be good for my bank balance!